The Kentucky Autism Training Center (KATC) is excited to introduce our new online newsletter. The online newsletter will be published each quarter to provide you with resources and information about KATC's activities. To celebrate our new online publication we would like to invite you to participate in a contest to name the newsletter. All name submissions can be sent to katc@louisville.edu by putting "newsletter name" in the subject line of the email. The top five entries will be published in the next newsletter and you can vote for your favorite. The winner of the naming contest will win a KATC gift bag, recognition and each newsletter will have the winning name at the top. Please submit your creative names today. We look forward to hearing from you! Check out the KATC's New Website! The Kentucky Autism Training Center (KATC) is very proud to unveil our brand new website! Our goal was to make it more user-friendly for families and professionals searching for information about resources, services and evidence-based practices. We've simplified the menu structure and reorganized the site by creating separate landing pages for families and professionals. Please let us know what you think. Contact Rebecca Grau at rebecca.grau@louisville.edu or (502)852-7799 with your feedback and suggestions. KATC created an address space on the back panel of the brochure for local contact information. Your group can place a standard mailing label (i.e. Avery 5160 - 1" x 2-5/8") in the space provided. You are invited to print brochures as needed. Contact Rebecca Grau at rebecca.grau@louisville.edu or 502.852.7799 if you have any questions. The Kentucky Autism Training Center (KATC) is excited to have piloted a new training project and completed the first portion of trainings in the beginning of November! The Eastern Kentucky Autism Training Project's main focus is to enhance education and services to meet the specialized needs of all individuals with autism spectrum disorders by providing families and providers in rural Appalachia with access to practical information and developing a network of local service providers with ASD-specific training to build the capacity for support of families in this region. Thirty-seven counties within the three Eastern Kentucky cooperatives were targeted and 30 counties were represented. With the help of Autism Speaks funding this project, 73 participants were trained throughout the region. There were a wide variety of professions that participated including: Executive Directors and Low Incident Consultants within each co-op, teachers, First Step workers, Family Resource Youth Services Centers (FRYSC) directors, community mental health providers, parents and other family support group members, day care trainers, university professors and more. The first two modules which were presented focused on Autism 101, Handling Stress and Increasing Coping Skills. Once the training was completed, all participants were then considered "trainers" and created action plans to continue providing these trainings to others that would benefit. Participants were provided with all materials to train others. Their packets included the power point presentations, trainer notes, pre and post test data tools, research articles used to create the presentations, a list of books used in the Amanda L. King resource library and a KATC Family Guide. The second portion of this training will be given in 6 months. Building on the momentum of Kentucky's partnership with the National Professional Development Center for ASD and informed by implementation literature the KATC, the Kentucky Department of Education and its eleven Special Education Cooperatives have developed a ASD Cadre of 750 educators across the Commonwealth. The goals of the ASD Cadre are to increase implementation of evidence based practices for students with ASD, build regional capacity and create tiered expertise. The KATC staff and the excellent trainers working at the co-ops, who have been responsible for delivering these 6-hour sessions, meet regularly to ensure the content is relevant to and accessible by all attendees. We look forward to spring when the content will further address instructional practices and increasing communication skills of learners with autism. We will also be launching a new web-based communication tool so that cadre members have easy access to resources and opportunities to network with colleagues from all across our beautiful Commonwealth! Finally, we would like to thank our partners at the Kentucky Department of Education for their leadership role in this project and their commitment to individuals with autism and the professionals entrusted to educate them. Team KATC attended the 2010 Ohio Center for Autism and Low Incidence (OCALI) conference in Columbus, Ohio November 17-19, 2010 to learn about how to improve state and system-wide programs, implementation, support and overall outcomes for those with autism spectrum disorders. The OCALI conference is unique because the KATC has an opportunity to network with other training centers across the country. For example, in the State Team Forum KATC staff and other centers discussed state and federal initiatives that impact those affected by autism spectrum disorder. KATC met with other cohort states working with the National Professional Development Center for Autism Spectrum Disorders. KATC had a strong showing at the OCALI conference. Below is a list of the presentations and posters contributed by the KATC. "Engaging Children with ASD Through Play and Shared Reading"
"Kentucky Autism Training Center: Training, Resources, and Supports"
"Where are we? Assessing the Needs of Adults with ASD Living in Kentucky"
"Functional Communication Training for Parents: A Comprehensive Guide for the Home"
"Sensory Interventions for Sleep and Behavior in Children with ASD"
"Literacy Interventions for Children with ASD"
"I like helping at the KATC. I am excited and happy to be working at KATC. I really look forward to learning more about how to work in an office and make friends at work." We are happy to announce the KATC's newest addition: JT McKay, our new intern. JT has been a strong supporter of the KATC for years through countless hours of volunteering and an ongoing commitment to fulfillment of our mission. The KATC looks forward to having JT on the team for the next six months. Adults diagnosed with an autism spectrum disorder, who have transportation to the KATC can apply for this rotating six-month opportunity. Working at the Center, the intern will assist staff in projects that support state services and fulfill our mission.The KATC Internship Program creates a mutually beneficial relationship where a person with autism spectrum disorder will be able to cultivate their employment skills, and the KATC gets some much-needed help on a variety of important projects. This program purposefully integrates individuals on the spectrum into network, program, and resource planning. Even more, the KATC Internship Program is just a start to our state supporting adults on the spectrum becoming integrated, important members of our community. Dr. Temple Grandin was recently in Lexington, Kentucky for a beef convention at the Hyatt Regency speaking to local beef producers on the proper handling of livestock. Dr. Grandin is well known for educating people throughout the world about modern methods of livestock handling to improve animal welfare and production. She designs livestock handling facilities for many large beef producers in the United States such as Burger King, McDonalds, and Swift. Dr. Grandin is Professor of Animal Science at Colorado State University where she teaches courses on livestock behavior and facility design. In 1950 Temple Grandin was diagnosed with autism. She did not talk until she was three and communicated her wants and needs through screaming, humming, and peeping. Her parents were told they would need to institutionalize their daughter. They chose not to go that route. Instead they sent her to a highly structured nursery school setting. Temple also spent much of her childhood visiting her aunt's farm. It was there that she began to recognize that she had a gift for recognizing and understanding animal behavior. functional approach to problem behaviors, and (f) family involvement (Iovannone, Dunlap, Huber, and Kinkaid, 2003). These are critical in regards to the outcome for the child. Iovannone, R., Dunlap, G., Huber, H., & Kinkaid, D. (2003). 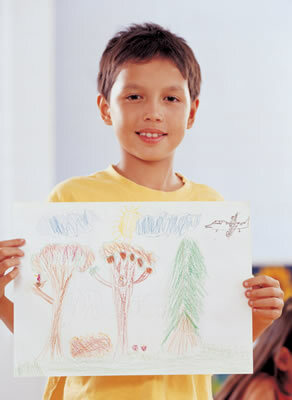 Effective educational practices for students with autism spectrum disorders. Focus on Autism and Other Developmental Disorders, 31, 343-349. Levy, S., Kim, A., & Olive, M. (2006). Interventions for young children with autism: A synthesis of the literature. Focus on Autism and Other Developmental Disorders, 21(1), 55-62. Odom, S. L., Brown, W. H., Frey, T., Karasu, N., Smith-Canter, L. L., & Strain, P. S. (2003). Evidence-based practice for young children with autism: Contributions of single subject design research. Focus on Autism and Other Developmental Disorders, 18, 166-175. Individuals with autism spectrum disorders (ASD) all have some level of challenge in social learning. A young child with ASD who is unable to navigate the social world may sometimes respond with challenging behavior. As a parent you are your child's first teacher. As such providing support for your child with ASD can seem a daunting task, however there are lots of great supports for you to access and become even more effective at meeting your child's specific needs. One free resource that is focused on the social-emotional skills for early learners and is quite extensive is the Center on the Social and Emotional Foundations for Early Learning (CSEFEL), accessible at http://csefel.vanderbilt.edu/. This resource has provided me with tips, tools, and strategies for supporting students in multiple situations and over time. For example, a student in my past work who was having difficulty with problem solving and would typically physical respond when confused, learned how to access the 'Tuck the Turtle' strategy for appropriately dealing with conflict. I urge you to spend some time surfing their website and specifically the resources and parent training modules accessed by clicking the "For Families" button. Also make sure you check out the "Infant/Toddler" and "Preschool" training modules. You can complete the entire module or pick and chose what elements are most important for your family. Finally a unique and important component of this website is the provision of their online content and resources for download in Spanish. The World Wide Web provides innumerable sites sharing resources for families with children with ASD and this one is definitely one to bookmark!